Salamanders are fire elementals, the unseen intelligences who allegedly inhabit the element of fire. 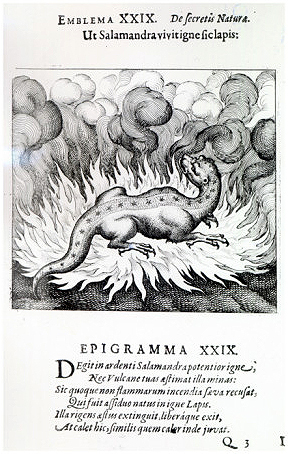 Paracelsus described salamanders as invisible beings of the fire. Belief in the existence of nature spirits is common to all cultures throughout history. They are said to have been here since the beginning of time, and to have created the landscape of reality. They are sometimes attached to a specific place, such as a tree, river, plant or mountain. Some are described as human in form, others are like animals or are half-human, half animal; some are helpful, others deceitful or malevolent. They are normally invisible to humans, except to those with the gift of clairvoyance. "Mediæval investigators of the Nature spirits were of the opinion that the most common form of salamander was lizard-like in shape, a foot or more in length, and visible as a glowing Urodela, twisting and crawling in the midst of the fire. Another group was described as huge flaming giants in flowing robes, protected with sheets of fiery armor. Certain mediæval authorities, among them the Abbé de Villars, held that Zarathustra (Zoroaster) was the son of Vesta (believed to have been the wife of Noah) and the great salamander Oromasis. Hence, from that time onward, undying fires have been maintained upon the Persian altars in honor of Zarathustra's flaming father. One most important subdivision of the salamanders was the Acthnici. These creatures appeared only as indistinct globes. They were supposed to float over water at night and occasionally to appear as forks of flame on the masts and rigging of ships (St. Elmo's fire). The salamanders were the strongest and most powerful of the elementals, and had as their ruler a magnificent flaming spirit called Djin, terrible and awe-inspiring in appearance. The salamanders were dangerous and the sages were warned to keep away from them, as the benefits derived from studying them were often not commensurate with the price paid. As the ancients associated heat with the South, this corner of creation was assigned to the salamanders as their drone, and they exerted special influence over all beings of fiery or tempestuous temperament. In both animals and men, the salamanders work through the emotional nature by means of the body heat, the liver, and the blood stream. Without their assistance there would be no warmth." "Salamanders have been seen in the shapes of fiery balls, or tongues of fire, running over the fields or peering in houses." See Dwarves, Gnomes, Boggard, Bogy, Brownie, Fairy, Elf, Paracelsus, The Boggart, Mystic Gifts and Charms - New Age Gift Shop & Wicca and Pagan Supplies, Love Spells -- Use these powerful love spells to help you find and keep your true love, The Tarot Store, The Chakra Store, Divination & Scrying Tools and Supplies, Unique Amulets, Talismans, Good Luck Charms, and Love Tokens, Powerful Witch Doctor Spell Kits, Powerful Spells - Cast by Andreika the Witch, Webmasters Make $$$, AzureGreen - Celebrating All Paths to the Divine, ISIS - Tools for Your Soul's Journey, and The Pyramid Collection - Myth, Magick, Fantasy and Romance. Sources: (1) Brewer's Dictionary of Phrase & Fable, Harper Collins Publishers; (2) Rose, Carol, Spirits, Fairies, Leprechauns, and Goblins: An Encyclopedia, W. W. Norton & Company; (3) Hall, Manly P., The Secret Teachings of All Ages, CreateSpace Publishers; (4) von Nettesheim, Heinrich Cornelius Agrippa, De Occulta Philosophia, Brill Academic Publishers. -- Feng Shui Software: Live a Happy and Prosperous Life CD-ROM. Heavenly Images, Angels and Cherubs. -- Happily Ever After: Fairy Tales for Every Child Activity Center. -- Shrek 2 Twisted Fairy Tale Fun. -- Snow White and the Seven Hansels. -- Click HERE for more related software. -- Click HERE for the best prices on top-selling software titles. -- Fairy Tale - A True Story DVD. -- The Fairy Faith DVD. -- The Fairy King of Ar DVD. -- The Magical Legend of the Leprechauns DVD. -- Fairies - Music and Stories from Fairyland DVD. -- Click HERE for more related videos. -- Click HERE for the best prices on top-selling DVD titles. -- Paranormal Investigations: Complete Edition. -- Understanding Parapsychology and the Paranormal. -- Click HERE for more new age and alternative beliefs courses . -- Click HERE for more related art prints and posters. -- Click HERE for related magazines and periodicals. -- A Field Guide to Irish Fairies. -- A Witch's Guide to Fairy Folk: Reclaiming Our Working Relationship With Invisible Helpers (Llewellyn's New Age Series). -- Among the Gnomes: An Occult Tale of Adventure in the Untersberg. -- Cherokee Little People: The Secrets and Mysteries of the Yunwi Tsunsdi. -- Elves, Gnomes and Other Little People, a Coloring Book. -- Enchantment of the Faerie Realm: Communicate With Nature Spirits and Elementals. -- Fairies: Real Encounters With Little People. -- Fairies: The Cottingley Photographs (Theosophical Classics Series). -- Fairies, Elves and Gnomes. 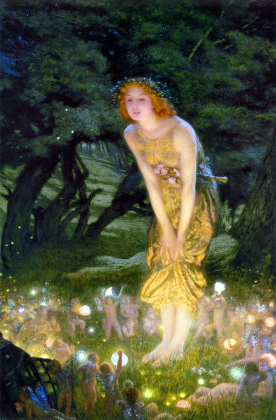 -- Fairy Spells: Seeing and Communicating With the Fairies. -- Gnome Life: A Monthly Celebration of Secrets, Tales, and Whimsy. -- Good Faeries, Bad Faeries: 2 Books in 1. -- Green Witchcraft: Folk Magic, Fairy Lore & Herb Craft. -- Hans Christian Andersen; the Complete Fairy Tales and Stories. -- In the Land of Cockaigne. -- Irish Myths and Legends. -- Irish Wonders: The Ghosts, Giants, Pookas, Demons, Leprechawns, Banshees, Fairies, Witches, Widows, and Other Marvels of the Emerald Isle. -- Kender, Gully Dwarves, and Gnomes. -- Nature Spirits and Elemental Beings: Working With the Intelligence of Nature. -- Shadow and Evil in Fairy Tales (A C.G. Jung Foundation Book). -- Spirits, Fairies, Leprechauns, and Goblins: An Encyclopedia. -- The Complete Book of the Flower Fairies (Flower Fairies Collection). -- The Complete Book of Gnomes & Halflings. -- The Elves of Lily Hill Farm: A Partnership With Nature. -- The Golden Books Treasury of Elves and Fairies: With Assorted Pixies, Mermaids, Brownies, Witches, and Leprechauns. -- The Haunts of Old Cockaigne. -- The Interpretation of Fairy Tales. -- The Memoirs of a Gnostic Dwarf. -- The Tarots of Gnomes. -- The Uses of Enchantment: The Meaning and Importance of Fairy Tales. -- Click HERE for more related books. -- Click HERE for the best prices on top-selling book titles. -- Nature Spirits and Nature Forces. 2012 - Will You Survive? Pagan, Wiccan, Metaphysical and Occult Supplies. An internationally distributed, mainstream quarterly dedicated to exploring the full range of Buddhist activity and its impact on Western Life. The Buddhist Review, the first magaine intended to present Buddhist perspectives to a Western readership. Published since 1949, it is one of the longest-running and most highly regarded magazines in the field. F&SF is the original publisher of Stephen King's Gunslinger stories, Daniel Keyes' 'Flowers for Algernon,' and many other classics. Master Hypnotist Reveals Forbidden Secret Of How To Control People's Minds (Without Their Knowledge) And Make Them Obey Covert Commands During Normal Conversation!. You really can hypnotize people in every day situations. Quickly and easily. Without them knowing what's going on. While they're fully awake... yet... under your hypnotic spell. 2012 Where well-meaning “experts” went wrong... and why governments of the world ultimatley decided not to tell you the truth. What is really going to happen in December of 2012... and exactly how millions will be affected, and your world will be turned upside down... forever! How you can safeguard your life... and the lives of your family members. Because you really can survive... and spiritually thrive in the wake of this life-changing event.